Submitted by Mason Hoberg on Apr. 6, 2018.. The Epiphone PR-150 is a great example of the combination of affordability and quality brought on as a result of automation. The PR-150 is a reproduction of the classic Gibson spruce/mahogany tone, making it a great option for guitarists who want that classic sound but can’t springe for a genuine Gibson. Another key selling point of this guitar, and something that doesn’t get mentioned enough about Epiphone instruments, is that it’s very durable. The guitars are built to withstand a lot of abuse, making them a great choice for musicians who don’t yet know how to properly care for an acoustic guitar. 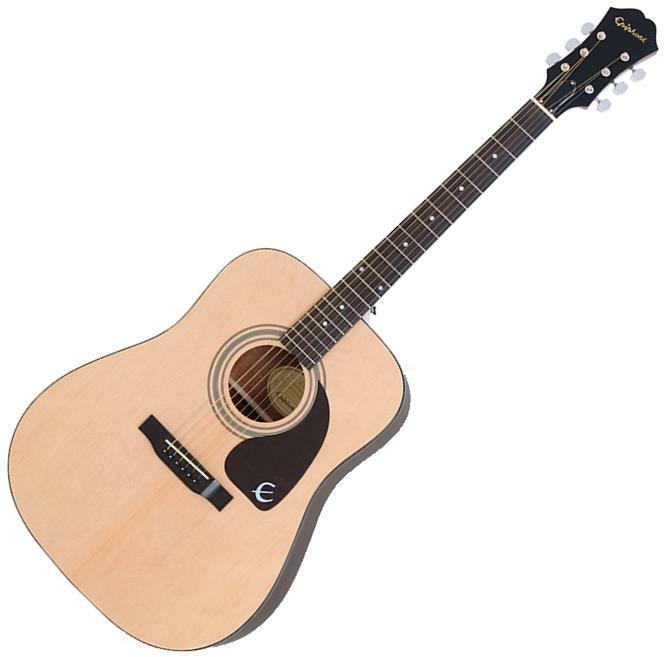 Epiphone instruments are also relatively low maintenance, even when compared to other guitars in this price tier. It can be a little difficult to find a shop still selling the PR-150, so if you can't find it at your local Guitar Center then take a look at these alternative recommendations for The Best Acoustic Guitars Under $200.